It could be what's for dinner tonight. Photo by Tara Donne. It's Chefs Travel week, and we're spotlighting chefs we love who are launching new cookbooks this season. We're looking at their books, their recipes, and, of course, their travels. Here's a simple pasta recipe from , the new cookbook from chef Gabe Thompson and his partners and co-authors, sommelier Joe Campanale and pastry chef (and wife) Katherine Thompson. This dish came about while I was rummaging through our refrigerator at home. Broccoli rabe and olives are a perfect match, and the almonds complement the nuttiness of the whole wheat pasta. Unlike most sauces, pesto is best tossed with pasta when it’s at room temperature, as the pesto can sometimes discolor and separate when too much heat is applied. Any leftover pesto can be spread on sandwiches or bruschetta. The wine: Pair with Red Hook Winery's Sauvignon Blanc, a crisp, full-bodied, food-friendly white made with grapes from Macari Vineyards. 1. Preheat the oven to 350°F. Bring a large pot of water to a boil. Season water generously with salt. Trim the bottom ends (one inch) off broccoli rabe. Blanch broccoli rabe in boiling water for two to three minutes, until it turns bright green and the stems are tender. Drain the broccoli rabe and spread it out on a cooling rack; let cool to room temperature, 15 to 20 minutes. 2. Meanwhile, place almonds on a baking sheet and roast in the oven until toasted and aromatic, about seven minutes. Allow to cool for five to ten minutes. 3. Roughly chop the broccoli rabe and set aside 1 cup. In a food processor, pulse the toasted almonds with the garlic until finely chopped. Add the cup of broccoli rabe, olives, and Parmesan. With the food processor running, slowly pour in 1⁄4 cup olive oil. Scrape down the sides of the bowl with a rubber spatula. Continue processing for 30 seconds to one minute. The contents should look like a bright green paste. Taste and add a pinch of salt if necessary. If the broccoli rabe was blanched in sufficiently salty water, the mixture should not need any more salt. 4. To make the pasta, bring another large pot of water to a boil. Season the water generously with salt. Add the pasta to the boiling water. Cook to desired doneness, one to three minutes if using fresh pasta. Reserve the pasta water. 5. Meanwhile, place six tablespoons of pesto and the two tablespoons olive oil in a large bowl. Add spaghetti to the pesto along with 1⁄4 cup of pasta water. Toss to combine. If the pesto seems too stiff, add a little more pasta water. 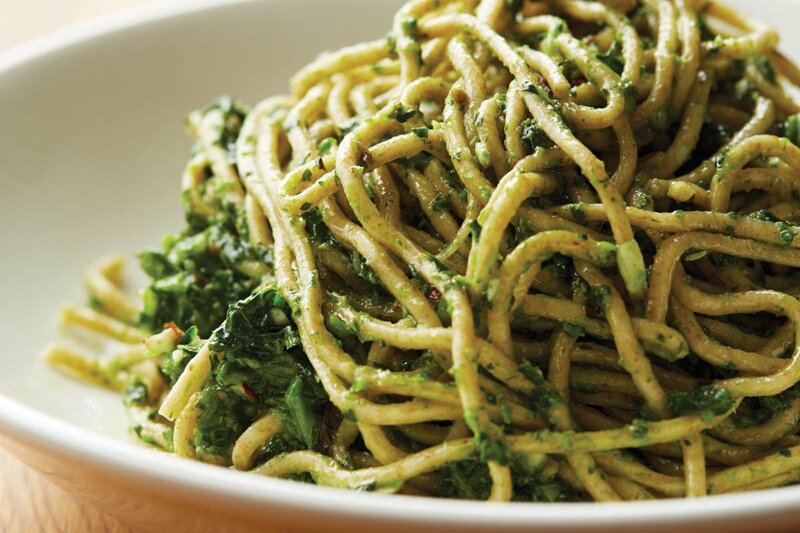 If you would like the noodles to be more heavily coated in pesto, add another tablespoon of pesto to the bowl. 6. Distribute the pasta among warm serving bowls and serve immediately. Buy , by Joe Campanale, Gabriel Thompson, and Katherine Thompsin (Amazon). Reprinted by permission from by Joe Campanale, Gabriel Thompson, and Katherine Thompson, Andrews McMeel Publishing 2014. Gabe is the executive chef and partner at L'Artusi, dell'anima, Anfora and L’Apicio, and Epicurean Events in New York City. You can follow him on Twitter at . He travels for the food, history, sites…but mostly for the food.